Re-introducing Nivea's Dermatologically Approved Lip Balm Milk & Honey!!! Nivea's unique combination of Milk & Honey extracts help moisturize & prevent drying, chapping or splitting for beautiful, soft & smooth lips. *Just to let you know the well known & trusted skin care specialists, Nivea have purchased Labello and are currently altering some of the names & packaging of their product. For example Labello Regular is now called Nivea Essential. Some quality ingredients, same quality product just a different name. 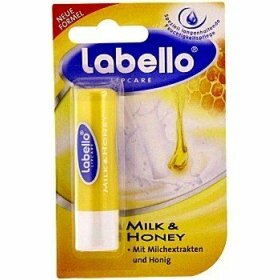 *Just to let you know while this particular flavor of Milk & Honey is thee last with the original label of Labello the well known & trusted skin care specialists, Nivea have purchased and have only changed some of the other Labello product names NOT the ingredients. For example Labello Regular is now called Nivea Essential, Labello UV is now called Nivea Sun etc. Same quality ingredients, same quality product just a different name. Octyldodecanol, Microcrytalline Wax, Hydrogenated Polydecene, Cetyl Palmitate, Ricinus Communis (Castor) Seed Oil, Polyisobutene, Pentaerythrityl Tetraisostearate, Polyglyceral-3 Disosterarate, Myristyl Myristate, C20-40 Alkyl Stearate, Cetearyl Alcohol, Bis-Diglyceryl Polyacyladipate-2, Butyrospermum Parkii (Shea Butter), Mica, Glycerin, Coppernica Cerifera (Carnauba) Wax, Simmondisia Chinensis (Jojoba) Seed Oil, Honey Extract, Nonfat Dry Milk, Tocopheryl Acetate,Ethylhexyl Methoxcinnamte, Butyl Methoxydibenzoylmethane, Beeswax, Vitis Vinifera (Grape) Seed Oil, Propylene Glycol, Neohesperidin Dihydrochalcone, Water, BHT, Phenoxyethanol, Fragrance, Yellow 6 Lake, Yellow 5 Lake.